I travel primarily for work which means my travels involve a lot of coffee. Airport lattes, morning briefings over cappuccinos, conference center coffee, there always seems to be an opportunity for a refill. That’s why I never travel without a reusable coffee cup or travel mug. It’s also good for the environment and one of the many ways to reduce the trash you create while traveling. When I first saw Keep Cups, I thought there were only a few colours and that they were a cute product, nothing more. Then, I had a roommate who moved in with her own Keep Cups in all sorts of sizes and colours. That’s when I realized there was a whole world of customization to discover. Keep Cups are a pretty solid choice for a reusable cup. The plastic ones are super lightweight, the lid has a nice feel, and there is a decent selection of sizes. If you want something more stylish, you can always get the glass ones. They also keep your beverage warm longer. I have both but for travel, I prefer the lightweight, non-fragile plastic. The fact that you can design and replace part à-la-carte is just a major cherry on top. One of the more annoying aspects of using reusable cups is remembering to bring them with you! If I am going out for coffee, it’s easy to remember to bring my reusable cup. But, if I am out and hours later, I get roped into a quick trip to a local café, I usually won’t have my cup with me. That’s why I really value ones that pack super small, so it’s not annoying to carry it around when I’m not using it. 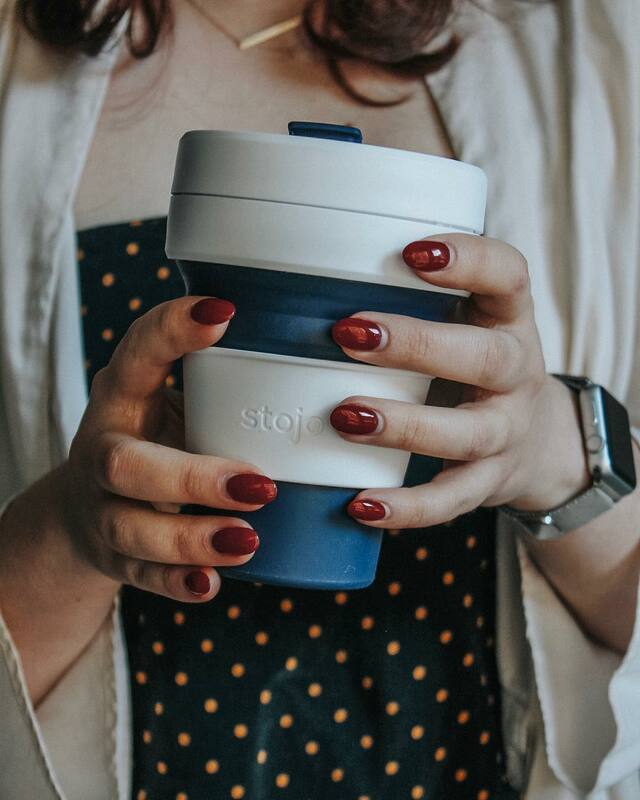 Enter the Stojo, a collapsible coffee cup. The fact that it packs down to a pancake size means I can toss it in my work bag and basically keep it with me forever. It doesn’t keep my coffee hot for that long, so this is good for people who don’t nurse their coffees. It’s also important not to squeeze from a silicone part but rather from the plastic lid or sleeve. If you drink just as many cold beverages as hot ones, than the Corkcicle line is for you. Their double-walled design is stylish and keeps your drinks cold longer. Doubles conveniently as a wine glass or cocktail glass around a campfire or on the beach. I have the Frank Green 8oz travel mug in white and taupe, and people often ask me if it’s a portable speaker or a Google Home. That’s because this particular mug brand follows the same design canons as many other trendy products on the market. It’ll fit right in with a minimalist’s design aesthetic. Otherwise, it’s a fantastic travel mug. They come in plastic or stainless steel and you can choose the combination of colours for your perfect custom mug. The lid closes completely, so you can flip it upside down, and it’s the perfect size for the coffees I order. It made my list of best travel buys of 2017.